The drama on the MTV hit wasn't scripted, says executive producer Gary Auerbach. But he did consult TV drama writers when working on the show. It’s Beef Week at HuffPost Culture. Fight us. A pretty, short-haired blonde ― a junior at the local high school ― rolls her eyes as she watches a room full of senior girls dance on hotel beds in black minidresses. She’s been over this party before it even began, and is trying to get her boyfriend, Stephen, to leave so she doesn’t die of boredom. “I like how we’re all wearing black and Kristin’s wearing white. How ironic!” an older, girl-next-door-type exclaims as she glares at the junior, who’s now loudly announcing her departure. Their beef is clearcut: the older schoolmate, Lauren Conrad (aka LC), is best friends with Stephen and thinks his current significant other “is the wrong girl for him.” Kristin Cavallari, on the other hand, isn’t a fan of the BFF, and is hellbent on staking her claim to Stephen. At least, that’s what the 2004 MTV reality series “Laguna Beach: The Real Orange County” led us to believe. To this day, Gary Auerbach, an executive producer who developed “Laguna Beach” through his company Go Go Luckey, would like us to think the greatest feud of early-aughts reality TV played out organically. In a recent interview with HuffPost, he continued to deny claims that the show was scripted. “I know people like to think it’s a scripted show, and I think most shows have since then gone more into a scripted reality arc, but we really didn’t plan it that way or do it that way,” he said. So how did MTV manage to turn what might have been a slight rivalry into a bankable primetime attraction? The process involved comforting nervous parents after Janet Jackson’s MTV-produced “wardrobe malfunction,” consulting with one-hour TV drama writers to learn the ropes of storylines, and persuading a hotel in Cabo San Lucas to let cameras inside a famous high school spring break destination. It added up to a reality TV formula that’s been co-opted and reproduced across networks ― from Bravo’s “Real Housewives of Orange County” (which premiered in 2006) to E’s “Keeping Up with the Kardashians” (2007). And that formula required a beef. “Laguna Beach” took the television landscape by storm when it debuted. It capitalized on the success of “The O.C.” ― which saw bad-boy outsider Ryan Atwood (Ben McKenzie) infiltrate a click of spoiled, rich Orange County kids in 2003. MTV, aware that its target audience was the same as Fox’s hit teen show, concocted an offshoot, highly sellable idea: a drama-reality series that followed the real kids of the O.C..
What it wound up being is one of the most successful reality shows of the 2000s, with the Season 1 finale drawing almost three million viewers. The sunburnt love triangle between Cavallari, Conrad and Colletti boosted the ratings, as loyal ’shippers tuned in Mondays at 10 p.m. to see which blonde would be winning in the seemingly choreographed fight for Colletti’s college-bound heart. 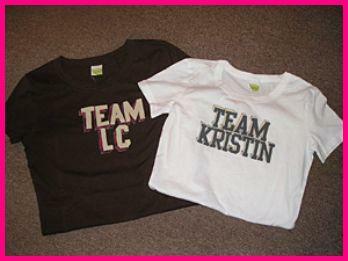 From the West Coast to the East Coast, Team Kristin and Team LC shirts went on sale in Hollister stores across the country. But Cavallari maintains that the outcome was the opposite of unexpected for the production team. She and Conrad “have never been great friends,” but producers pushed the love triangle tension into something bigger than it actually was. The man of the hour, Stephen Colletti, of MTV's "Laguna Beach: The Real Orange County" in 2004. She insists that Colletti was her actual boyfriend and that Conrad was never more than a friend to him. It was the showrunners who put the three of them in situations that would test the hormonal waters. According Auerbach, though, Cavallari and Conrad’s rivalry reared its ugly head as early as the casting period. Playing that up “was a very simple choice because, in real life, there was a love triangle going on between Stephen, Lauren and Kristin,” he said. Part of the reason the feud took off with fans was because Cavallari and Conrad were so different, Auerbach said. Viewers either rooted for the self-assured junior with the sassy attitude or the laidback senior who was everybody’s buddy. So did he stoke the fire at all? Auerbach continued to reiterate, time and time again, that he and fellow producers, including his wife Julie, didn’t script the show. But he did say they sought out advice from drama TV writers. He asked the cast members what they would be doing week by week, in order to get a sense of the plot points producers could incorporate. “If they went to dinner, [we’d ask], ‘Can we follow you guys? Where are you guys going so we can figure out if we can shoot there?’ That was the main impetus for us. Like Cabo was them; they were going to Cabo for spring break. We had nothing to do with that other than you had to call the hotel to figure out if we could shoot there and such,” Auerbach said. Lauren 'LC' Conrad and Kristin Cavallari introduce INXS's performance at VH1's "Big in '05" show. As for the more generic role a feud plays in the schematics of a reality show, Auerbach confessed that the one-on-one beef is an effective jumping off point. Fifteen years after the show’s debut, the Kristin-Lauren rivalry is pretty tepid. After they separately appeared on MTV’s “Laguna” spinoff show, “The Hills,” both women became prominent influencers, achieving the apex of a post-reality TV show career. Conrad runs her own lifestyle website and fashion brands LC Lauren Conrad for Kohl’s and The Little Market; Cavallari launched a jewelry line, Uncommon James, and her own reality series on E!, “Very Cavallari.” Both are also New York Times best-selling authors. Maybe this seems like fuel for another feud, but Cavallari would disagree here, too. Just as their relationship statuses have changed, so has the draw of reality TV. Audiences have had years to learn the choreography, growing more and more accustomed to the sight of two women duking it out in predictable ways over the span of approximately 15 well-edited episodes. Sure, we could watch the Real Housewives toss drinks and tables at each other for the 400th time, or eat a tub of ice cream while witnessing the latest iteration of sister-sister drama on “The Kardashians.” Or we could also just scroll through Instagram to see loathing unravel in real time, à la Kim Cattrall and Sarah Jessica Parker or Taylor Swift and Katy Perry.